Recently crucial and monumental cuvée called "Champagne Jestin" has been released. This is a great achievement of Hervé Jestin's wine-making, the starting point to the further revolution and passing point at the same time. To know this Champagne is to review past ten years and to declare to be a witness of Champagne New Era for next ten years. "Earth has changed very fast since 2006 and with her the way to drive the winemaking is different. Although it is difficult to explain generally, apparently it is much easier for Asian to understand my approach. My idea is that every vintage is a sort of mirror of the human being changing"
Herve Jestin partnered with Benoit Marguet to create this wine, the first ever certified organic prestige Champagne blended from across the region. They released same wine with two different labels. One is Champagne Jestin, the other one is Sapience/Marguet. Grapes are from the fellows of Hervé Jestin, Vincent Laval(Cumières, PN&PM, Biologic) and David Leclappart(Trépail, CH, Biodynamie). The wines were vinified in the cellar of Marguet. The explanation hereunder is just for reference for the connoisseurs or professionals who wants to know more about his wine. And we can provide more details if you wish. Please contact us with your question by e-mail. Big maisons are also being influenced by Hervé Jestin today. Louis Roederers hired Hervé Jestin(until 3 years ago), Moet et Chandon, Taittinger, Laurent Perrier and some other big houses started to study about biodynamie and Feng-Shui based on scientific recognition. All of Hervé Jestin's theory and practice are based on Biodynamie. Generally "Biodynamie" is considered as the matter in the vineyards and it is separated from wine-making in the cellar. In fact, most of Biodynamique producers(or Vin Nature producers) are trying to minimize the operation in the cellar. They are thinking that less intervention is better. 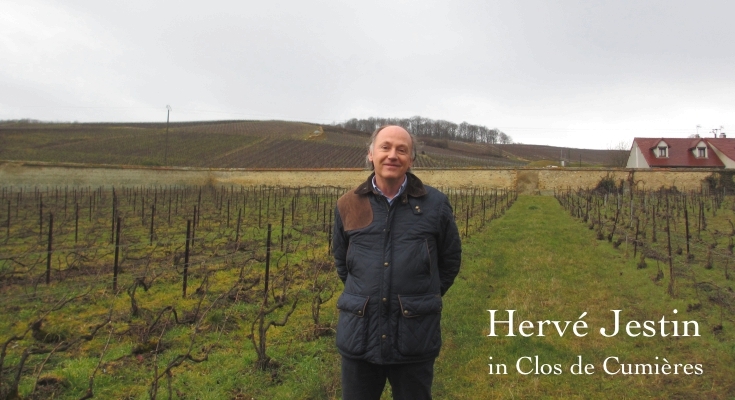 However Hervé Jestin says his Biodynamique approach keeps on running in the cellar. He widely and deeply applies concept of Biodynamie to operation in the cellar. As a result, he has successfully maintained(rather enhanced) "energy and vibration" of biodynamic grapes to the wine, and transferred them into the bottle without any loss. Please remember the sense of Feng-Shui. Biodynamie and Feng-Shui has lots of similarities and it is telling same thing by different language. Practically Hervé Jestin's method includes these approaches.